This time we’re going to look at just how brakes do what they do, and ways to improve them. Without a doubt the most important point to get sorted at the outset is just what makes brakes do their thing - FRICTION. The sole purpose of the brake set-up on any vehicle is to convert kinetic energy into thermal energy. In English that’s motion into heat - friction. The motion of the disc/drum across the surface of the pad/shoe produces a prodigious amount of heat. The contact of these components and the heat generated creates friction - making continued motion very difficult. Try gently applying hand pressure to a drill chuck when it’s slowing down. Apart from speeding the slowing down process, you’ll notice your hand getting considerably warmer - friction. Excessive heat can be counter-productive. The correct operating temperatures are a relatively fine line so this also needs consideration. The amount of friction developed is dependent on a collection of components, but ultimately occurs at the disc/drum end of things, so the rest of the system and components should be built up around that. As drum brakes are desperately ineffective, I am going to concentrate on discs - the most common type of conversion. Anyone converting from a decent disc-brake set-up back to drums for any reason other than originality needs their head examining. 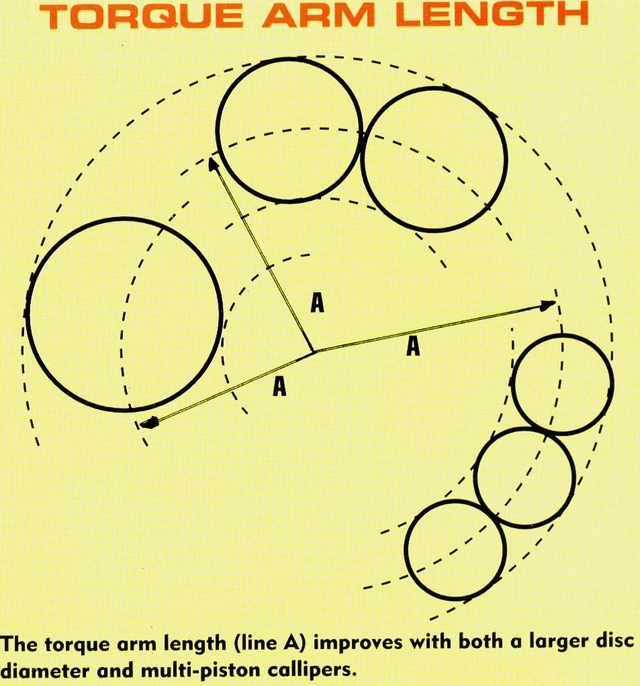 OK, so far in both swept area and torque arm descriptions, I have mentioned limitations. Apart from physical fitment, the main limitations centre around the ability of the brakes to over come the tyre grip and vice versa. The first tends to lock the wheels up, vastly reducing the grip on the tyre on the tarmac - therefore also severely reducing retardation. The second develops excessive heat, building up to a point where the pads and discs become ineffective - otherwise known as ‘fade’. Again retardation is greatly reduced. Therefore trying to cram an 8.4” disc into a ten-inch wheel set up isn’t generally a good idea. 7.5” discs on a thirteen-inch wheel car are going to be disadvantaged too. Fitment of a servo isn’t the answer, as this tends to magnify one or other of the problems. The servo is purely an instrument to reduce the pedal pressure necessary to operate the brakes. But I’m jumping the gun on ‘other brake components’ here. As with all modifications applied to up-rate/improve your Mini, careful thought is needed. All the other components in the system need consideration, and whether they are functioning properly. I do not intend to cover full servicing of the braking system here - suffice to say that maximum performance will only be attained from correctly serviced and properly functioning parts. A very necessary part of the system this as it is he/she that instigates the braking events. Applying ones foot to the pedal is the start of the retardation process. This component is very variable, and sometimes each vehicle sees a number of different ones. No matter, the only over- riding factor here is how much spinach each one has consumed as to the amount of input required. The human body being the amazing piece of machinery that it is allows each to have a totally variable input independent of the sum of the other components on the Mini, combining thought with feel - i.e. ‘I want to slow down quicker’ so the pedal is pressed harder. That sort of thing. The only direct contact the driver has with the braking system is the pedal. The pedal has a lever ratio all of it’s own, being calculated by the difference in length of the pedal to the pivot pin, and from there to the master cylinder cotter pin. Increasing the length between the pedal and pivot pin will give more pedal travel, but reduce the effort needed to apply the brakes. Reducing it has the opposite effect. Therefore an increase in ratio gives a softer pedal with more ‘feel’, reducing it the opposite. Changing this particular component is a bit involved though, and is generally unnecessary as it suits most combinations of the other components. The master cylinder translates the pedal movement into fluid movement. The bore size dictates how much fluid is moved for any given pedal pressure, and is directly related to the main brake component - the caliper. Bigger diameter or multiple pistons will need more fluid displacement to make them work properly. This generally means a larger bore master cylinder is needed for any given application. However, as this component can be very costly to replace, most folk stick with the standard one. It will work OK, but means that on the multi-piston calipers there is more pedal travel than normal. The good news is that a smaller bore means higher line pressure for any given pedal pressure - less driver input for same braking effort, and better ‘feel’. 'Feel', incidentally, is the sensation of what the brakes are up to, and is an important part of our thought process as to how much pressure we need to apply to the pedal in any given situation. For information sake, the Mini master cylinder has a 0.70” bore. The old Cooper 997 had a bore of 0.750” largely because of the pathetic size of the discs - a great deal of pressure was needed to slow the car down but would be ace on a four-piston caliper set-up. The old Austin 1300 also had a 0.750” master cylinder. Both of these types are desperately rare now though. Some misguided folk have actually fitted a clutch master cylinder in place of the brake one as it also has a 0.750” bore. This is EXTREMELY fool-hardy as it has no internal return feature, so could leave the brakes on all the time once applied! For race Minis, going to a 0.875” bore master cylinder is best. There isn’t one that looks and fits just like the Mini one, it necessitates going to a master cylinder with separate fluid reservoir and making a suitable push-rod. No problem though as Girling and AP make a cylinder that will fit the stud pattern, a standard Mini push-rod can be easily modified to suit, and the reservoir is easily mounted to the bulk head. And is surprisingly cheap - less than a new Mini split-system one in fact! When trying to get the best master cylinder bore size for application, you need to remember that the amount of hydraulic pressure produced at the pedal is INVERSELY proportional to the master cylinder bore. So if you are locking the brakes up too easily, you need to INCREASE the bore size. Consequently if you are standing on the pedal, pulling of the steering wheel and gritting your teeth together to lock the brakes, a smaller bore is the order of the day. Improving the performance of the disc itself has seen three types of modification - venting, slotting and drilling. Vented discs have become pretty much a standard item on modern cars as a more efficient disc temperature wise can be fitted into a smaller area. This contradicts the 'bigger is better' principle, but modern technology has seen improvements in pad materials, so small cars that are fairly heavy can have good brakes without going to huge wheels to fit them in. The Metro for instance. A smaller vented disc does have slight advantages over a bigger solid disc in the effects of inertia stakes. Drilling discs is open to the same misunderstanding that slotting is. The same actual reasons apply, except that holes are more effective over time as they are more or less self-cleaning. The only major draw back (apart from going mental on the number of holes - friction area reduction again) is that in discs with insufficient mass - too small in diameter or too thin - they tend to crack and fall apart. I know motorbikes don’t have these problems, but they are a totally different kettle of fish! The 8.4” disc can be drilled - but needs to be done by experts, not at home in the shed - it's your life (and possible other's) that you're fooling around with.